On a minor note, I've increased the body depth of the 18" Master to 3 3/8". I've always loved the look of the Super 400 and it seems only right that this archtop should look impressive from all sides (if your heart is set on 3", however, I probably won't turn you down). 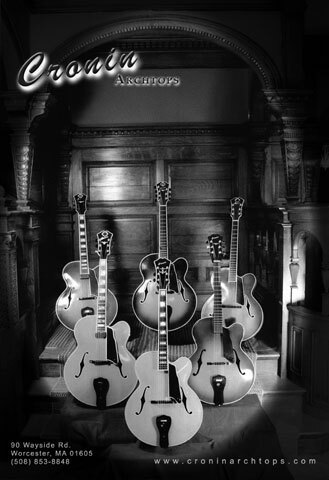 As of the August, 2000 issue, Cronin Archtops is a proud advertiser in Just Jazz Guitar magazine. If for some reason, you haven't seen this publication, it is without question the best resource for anyone who loves jazz played on an archtop. Strange, but trueat $9.00 per issue, it is the best bargain you'll find in any type of magazine; full-length articles, interviews, reviews, transcriptions and instruction. Click the thumbnail images for a full-size image of my ads in the August and November, 2000 issues.